Are you tired of forgetting to check if you still have enough washroom supplies? Do you have a problem finding space to store your washroom supplies? 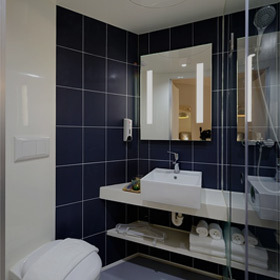 Our washroom service program can help you to alleviate these problems and provide you with paper products, soaps and air fresheners (click on the Products section for more information on our extensive line of washroom supplies). How does our program work? After you sign up for this program, we will take care of all your washroom supply needs. We come on a regular basis and check your washrooms for supplies. If it needs to be replenished we do it right away. There is no need for you to worry about storing supplies, we take care of this for you! We can improve sanitation, reduce waste, and promote cleanliness! Please eMail us or call us today to learn more about this carefree exchange service!